Interesting hearing aids Devon U.K.
We are always looking at events and new innovations from around the world. Today we are sharing a company that are available in the U.S. and now the U.K.
Why should a hearing aid look like a hearing aid? That’s the question Sivantos engineers asked themselves when designing the new Signia Styletto receiver-in-the-canal (RIC) hearing aid which is being launched today. 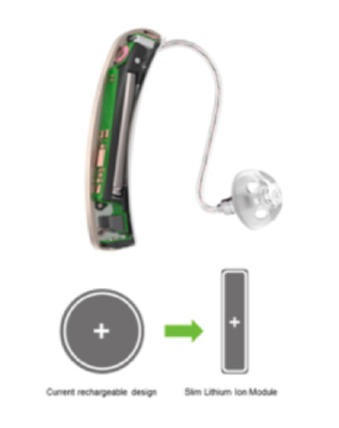 Styletto is a rechargeable SLIM RIC that features a contemporary design and breaks the mold of traditional behind-the-ear (BTE) hearing aids by taking advantage of how its lithium-ion battery technology doesn’t need to conform to the traditional size and shape of a button cell. 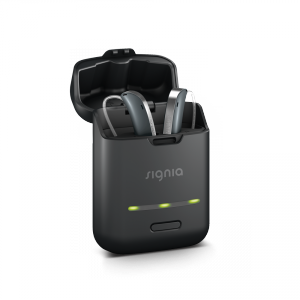 The new RIC, which uses the Signia Nx platform with Own Voice Processing (OVP), also comes with an extremely small charger which offers fast charging solutions as well as three full charges on the go. Styletto uses a slim-pin design instead of the current coin or button-cell design. Stylistic freedom by thinking outside the button cell. In terms of the history of hearing aids, Branda points out that, going all the back to the original body-worn devices and moving into today’s CIC and RIC devices, hearing aid sizes and styles have been dictated by the size and shape of button cell batteries. Although lithium-ion rechargeable batteries have also been built in this coin design, they’re not restricted to it—as demonstrated by the new Styletto SLIM RIC. Instead, it departs from the traditional coin cell look by using a slim pin design to create a new form factor. Differentiating a hearing aid practice by appealing to different wearers. With its slim, elegant design that harkens to other high-tech product categories, Styletto provides a new option for those who might be put off by the traditional look of a hearing aid. In a US study of 500 mostly new users (92%) with moderate hearing loss, Sivantos found that when participants were given a choice between traditional BTE (Motion) or RIC (Pure) designs, or given the option of no hearing aid at all, more than half (57%) opted for the RIC, 19% selected the BTE, while almost one-quarter (24%) chose to go without a hearing aid. However, when the new Styletto was inserted into the study as an option, 90% of the participants selected a hearing aid: 65% of the study participants selected the SLIM RIC design, while about equal percentages opted for either the BTE and RIC (13% and 12% respectively), and only 10% chose no hearing aid at all. Similarly, when consumers looked at a simulated practice storefront window with a standard portfolio, only about 16% of the participants chose an offering without Styletto, while 84% of people chose an offering with the new aid. Portable rechargeability for the wearer. The Styletto’s recharging case is very small, and reportedly offers 19 hours of full-day use with a 3-hour charge. If the wearer forgets to charge the device, they can drop it into the charger for 30 minutes and be able to use the device for 5 hours, says the company. The charger also carries three additional full charges. Thus, if the user starts out in the morning with a full charge and the charger is fully charged, they actually have four days of portable battery capacity available to them, according to Sivantos. The charger also contains an LED indicator to view the status of the charging, as well as an automatic on/off feature which means that the charger can serve as the primary carrying case. The Styletto recharging/carrying case is exceptionally small and carries 3 full charges. Nx technology. 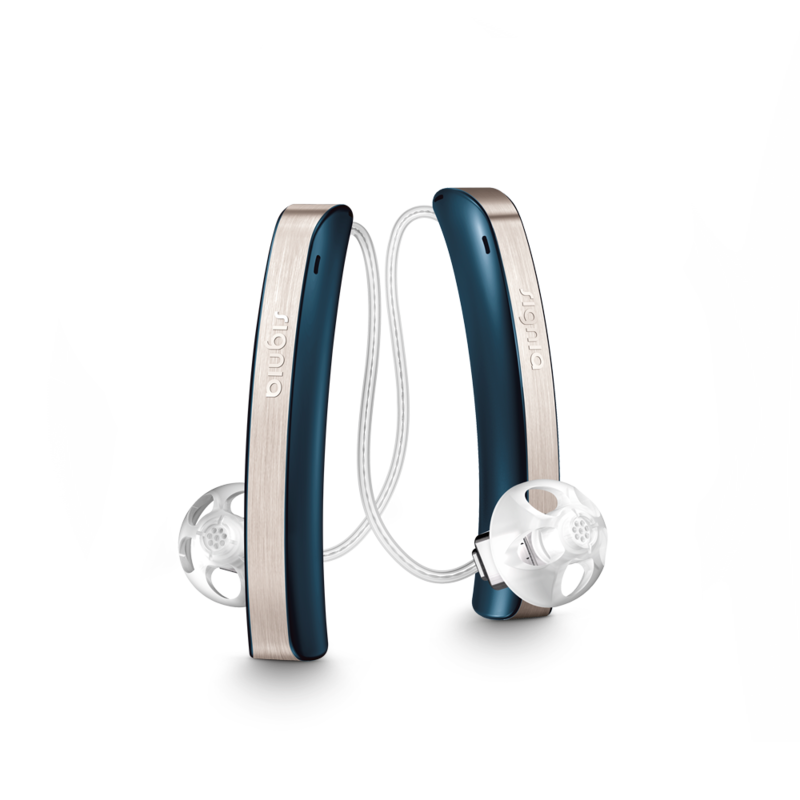 The Styletto hearing aid uses Signia Nxsignal processing which is designed to emphasize a natural experience using Sivantos’ Own Voice Processing (OVP) technology. 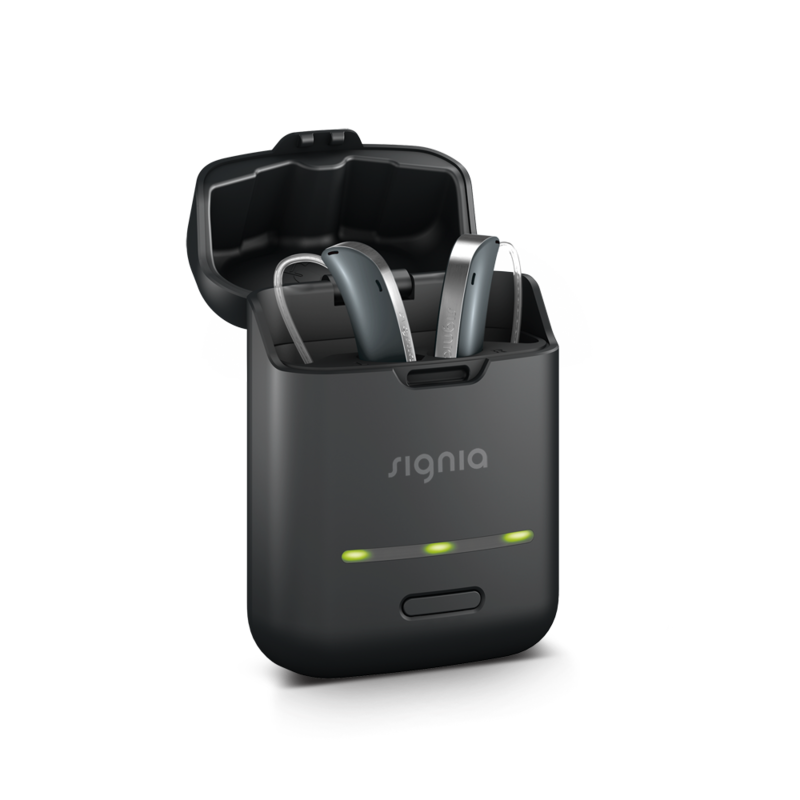 Signia’s ear-to-ear wireless (Ultra HD e2e®) is used in OVP as well as the hearing aid’s Narrow Directionality for a more natural sound quality and better speech intelligibility in noise. 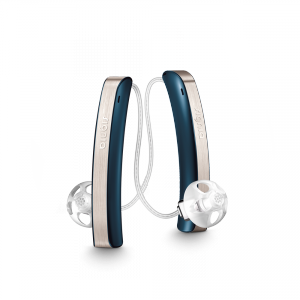 The wireless technology also enables the device’s Twin Phone capabilities, which allows the wearer to place the phone up to the ear, obtain the acoustic signal, and then the hearing aid wirelessly sends the signal to the opposite ear for binaural advantage during the phone call. The sleek instrument does not have push-buttons or a volume control. For those who want more control, the touchControl®App is a downloadable cell phone application that allows for the changing of volume, programs, and directionality. 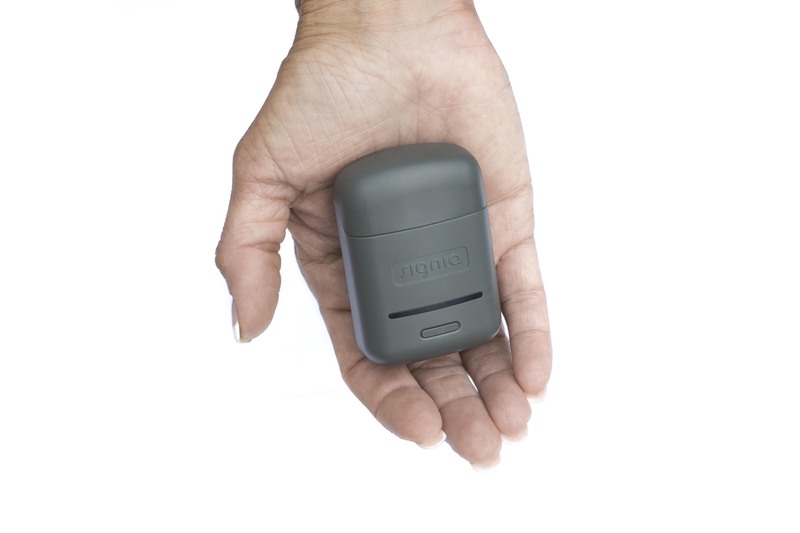 Similarly, miniPocket™, which resembles a keychain type remote control, allows for volume and program changes. Styletto is available in all three of the Nx performance levels (7/5/3) and uses a Size M (60/119) receiver in lengths 2 and 3. The device is applicable for people with mild to moderately severe losses (60 dB gain). https://honiton-hearing.co.uk/wp-content/uploads/2018/11/Honiton-hearing-centre-Rechargable-hearing-aids-Honiton-Devon-Exeter.jpg 640 639 admin https://honitonnew.leecurran.co.uk/wp-content/uploads/2018/03/honitonhearinglogo.png admin2018-11-19 11:12:192018-11-19 11:25:51Interesting hearing aids Devon U.K. Cheapest hearing aids in Devon?